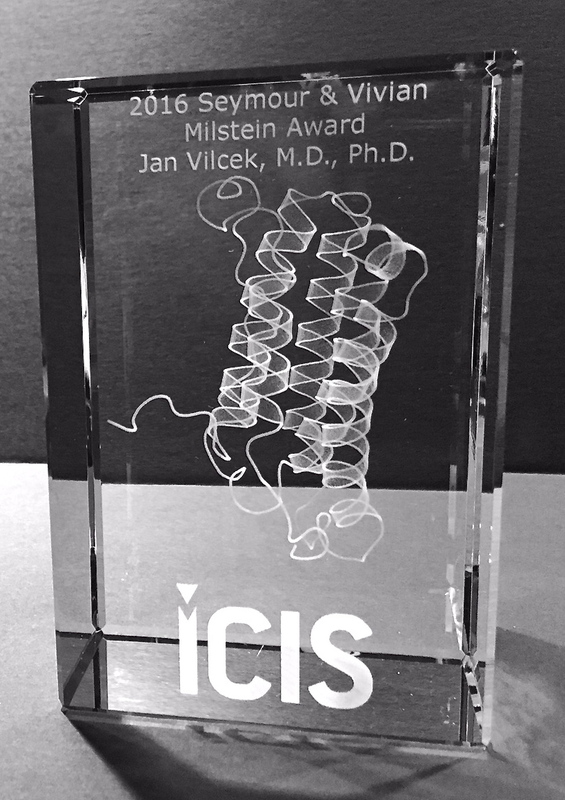 For 28 years, the Milstein Awards have represented the pinnacle of scientific achievement in interferon and cytokine research and are conferred each year by the International Cytokine & Interferon Society (ICIS) at a special event during its annual meeting. The Milstein family—Vivian, her late husband Seymour, their son Philip and their daughter Connie—are well-known philanthropists in the United States and abroad. For more than 50 years they have provided essential support for institutions and organizations at a time when funds from government agencies have been drying up.The preeminent Seymour & Vivian Milstein Award for Excellence in Interferon and Cytokine Research, commonly known as The Milstein Award, recognizes individuals who have made exceptional contributions to interferon and cytokine research, either in a a basic or applied field. Many of these achievements have led to the advancement of human health. The Milstein family also supports The Milstein Young Investigator Awards to recognize the work of individuals who have made an impact on interferon and cytokine research early in their careers, and The Milstein Travel Awards to give those who may not otherwise be able to attend the Annual Meeting of the ICIS an opportunity to share the most current interferon and cytokine knowledge with peers from around the world. The Seymour & Vivian Milstein Award for Excellence in Interferon and Cytokine Research, represents the pinnacle of scientific achievement in interferon and cytokine research. This award is bestowed upon a leading biomedical research scientist who has made outstanding contributions to interferon and cytokine research, either in a basic or applied field. Many laureates have made seminal advancements that have enabled the successful treatment of disease or have the potential to lead to significant health benefits. The Milstein family understood the importance of interferon research early on and established the Seymour & Vivian Milstein Award for Excellence in Interferon and Cytokine Research in 1988, two years after interferon was first approved for the treatment of hairy cell leukemia. Since that time, it has been widely recognized that interferons and the larger class of cytokines play critical roles in the development and progression of many major diseases including cancer, viral diseases such as hepatitis and influenza, and autoimmune disorders like multiple sclerosis and lupus. The winner will be an invited speaker at the annual meeting. ICIS members who will attend the upcoming annual conference and who have received a Ph.D or M.D. within the previous 10 years are eligible. Every year up to five awards are granted to individuals who have made notable contributions to either basic or clinical research. This award is provided by a generous gift of the Milstein Family. ICIS members may apply themselves or nominate other eligible members for Milstein Young Investigator Awards. A CV and letter of recommendation (including confirmation of eligiblility) should accompany the application. ICIS members who will attend the upcoming annual meeting are eligible for Travel Awards. They are provided through a grant from the Milstein Family based on the scientific merit of the abstract and financial necessity. This award does not exempt payment of the conference registration fee. There are no age restrictions to this award. However if both senior and junior members from the same laboratory apply for an award, preference is given to the junior member. The award is dependent on the availability of funds. List of 2017 Milstein Travel Award Winners to be updated here soon. Cancer Associated Inflammation: Role of Cytokines and Interferons, JICR FREE Issue through February 5, 2019.